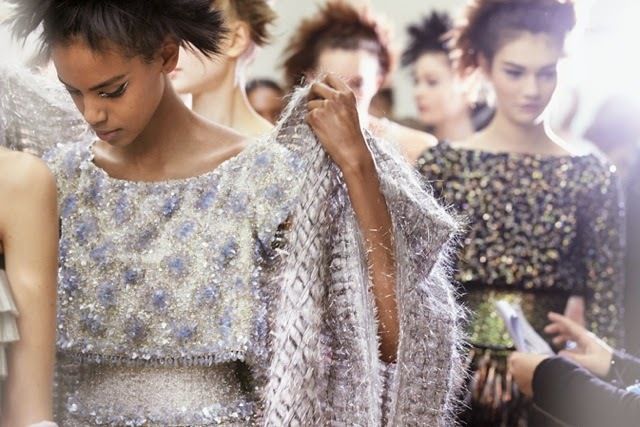 As you may know, Paris Haute Couture Week fell from the 6th of July until the 10th for designers to display their Fall/Winter 14/15 collections. My previous post was on my favourites from a select number of shows that happened earlier in the week and this post focus on my favourites from shows that appeared later on during this week. 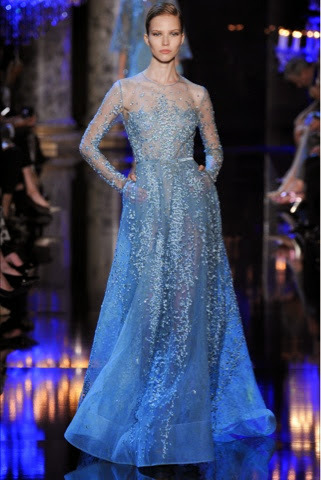 The first pieces I have to show you are from Ellie Saab, who never disappoints. Elegant, regal and feminine, the brand and it's designs are the epitome of classic beauty. My first few thoughts on these looks were "Elsa? 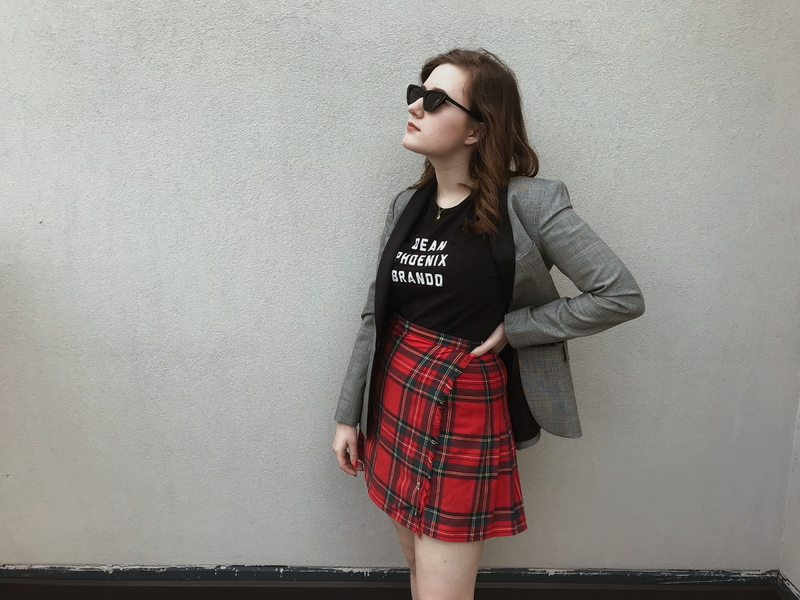 Has she lent her wardrobe or become a muse to the brand?" when I saw these regal looks I couldn't help but be reminded of the Disney musical (though one things these dresses are not is a caricature) and knowing that Frozen is being a broadway play I'm just hoping the wardrobe budget is large enough that they can buy one of these dresses for the princess part. I guess princess is another word used to describe the dresses, so delicate and intricately detailed you can only imagine someone who has such a grace of a princess, or silver screen actress such as Audrey Hepburn or (also a princess) Grace Kelly. As seen the dresses have been embellished with beading. 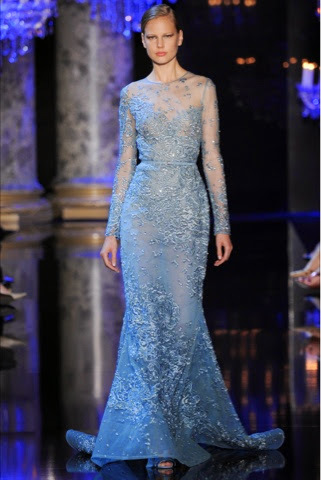 It is not unusual for Ellie Saab to have a skinny belt on dresses, alone with sleeves. The dresses for the most part had a simple shape, many had a slight flair or small aline. The torsos of the dresses were fitted but not tight and just the right amount of sequins were added. Not so much that is was over bearing and over the top, but instead the dresses had a luminescent quality to it when the lights would hit them. 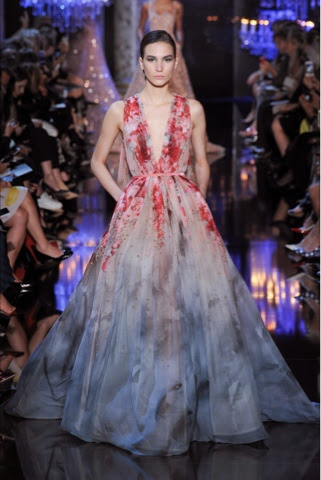 Florals also played a part in the show, espiecially in the ballgowns, it was a graduation of florals into other prints however, almost like a much more dramatic ombré effect, that Ellie Saab is known to use. For some reason, one that I don't exactly know why, I have a huge desire to see Lupita Nyong'o in this dress pictured above. We all know she can dress feminine (my face replicates one of Homer Simpson drooling over food when I think of the Prada dress she wore to the Academy Awards) more often than not she is wearing bold colours and prints and I'd love to see her in this for the most part barely there dress, I just think the colours would sit amazing on her skin and she can pull off being graceful so effortlessly that her wearing Ellie Saab could only result in good things. If you know me you know I'm not a fan for ballgown type wedding dresses, my own personal opinion is they've been overused too much the past few years, espiecially with fabrics like tuelle and oversized incrusted jewels, which had me in the predicament of gradually finding them tacky, but maybe it's the depleting effect of the flowers and embellishments on the skirt, or the fact that the dress has a Ross undertone instead of ivory or cream, or the overall softness of the materials, but I simply love this wedding ballgown. It's huge, but just as delicate as any of the designs in the collection. Brava Ellie Saab. 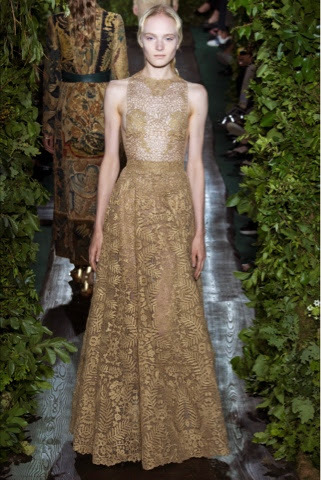 The next few designs I have to show you are from the Valentino Haute Couture Show. The designs showed a clear Greek mythology inspired contemporary look and had a pagen or goddess feel to them. The gladiator sandles the models wore only added to the Grecian and Romanesque effect. Colum dresses were present and draping was used in many of the designs, but kept simple. Many dresses also had a tapestry print on them and pleating added to the gladiator look. Waists were defined by belts made of the same fabric as the dress they were on, or by a slight peplum. 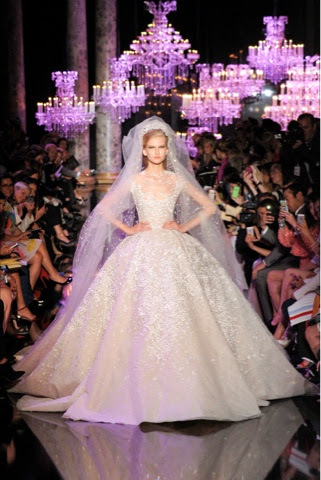 Now, to the last designs I have to show you, all from the Zuhair Murad Haute Couture Fall/Winter 2014-15 collection. Black and white in the form of monochrome, red, cobalt blue and metallic silvers were all huge colours in the collection, as was the fabrics displaying a wave rippling pattern and strong geometric shapes, mainley triangular. These looks were kept dramatic by the beading and embellishments, strong contrast of colour and animal like zebra print. They are just as feminine as they are dramatic, as the soft draping, strapless neckline and ballgown shape all add to it. Another pair of bold looks from the collection, mainley due to the bold red colour of the fabrics. An animal influence theme continues as the first red dress has a spider web like pattern sewn onto it with small crystals, the second dress has the material all directed and falling in one way, which accentuates the small waistline, the technique carries onto the blue dress seen below. The two dresse above are similar in the sense that they both have patterns and fall simply to the floor and both possess sleeve and have embellishment that makes it sparkle. On one the pattern is more subtle, geometric, rows of vertical lines with what resembles a vertical row of peacock feathers inbetween them. The other resembles the unpredictable directionality of the sea with swirling embellished lines of blues and sea greens. Both have small gold belts. And the rain of skinny belts continue, along with a more obvious geometric pattern in the dresses. 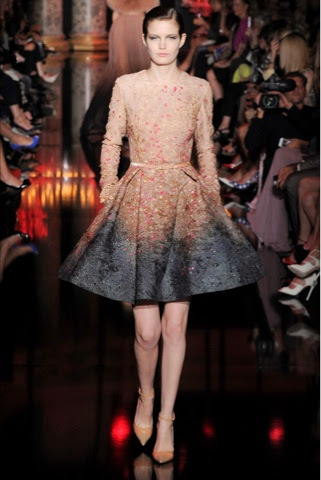 Each dress has small crystals were the lines of the pattern are to make it more noticeable. It is in the last two dresses that they show a symmetry, the side that has the leg slit has an arm fully covered in fabric. 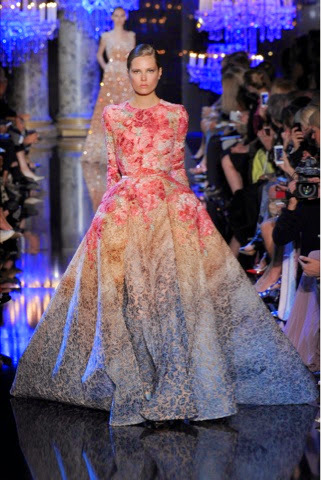 There's the end of my review for Paris Haute Couture week, I hope you enjoyed reading my post as I had lusting after all these magnificent designs. If you're familiar with my blog you will know I do a monthly wish list, but I'm highly doubtful that any of these gorgeous designs will appear on it, (while it's a wish list, I do make it my aim for it to be slightly affordable) I'm also excited to see if any of these dresses will be spotted at events, I love seeing how people make a design they own and customise it, whether it be with accessories, make up, or hair. In case you missed it, I also have a part one including even more fabulous haute couture creations, which you can see as it is my previous post.